It's a baseball party! 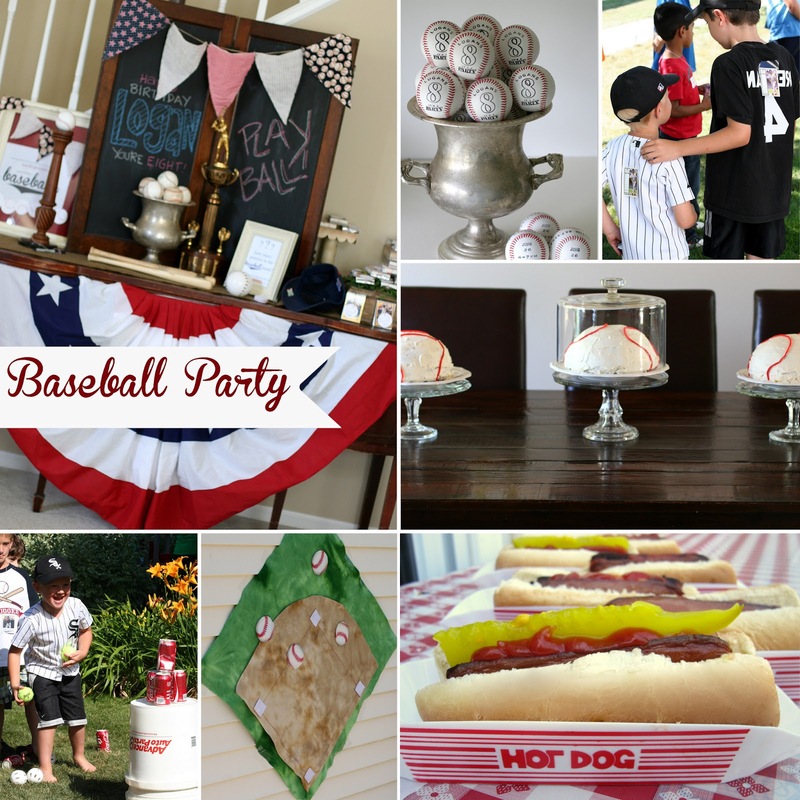 Here's a comprehensive post on my son's Baseball Birthday Party, organized into sections: Invitations, Decorations, Activities, Games, Food/Menu, Cake, and Favors. Although we have a very small yard (less than 1/4 acre) I decide to have the baseball party outside so we can take advantage of several baseball-themed games. We also need the room, as there are 30 kids who are coming. Crazy, right? Most of the kids in attendance are four-year-olds to nine-year-olds, and they all seemed to enjoy things fairly equally. So hang on. It's a rather long post, but hopefully you will get some ideas for your own party. 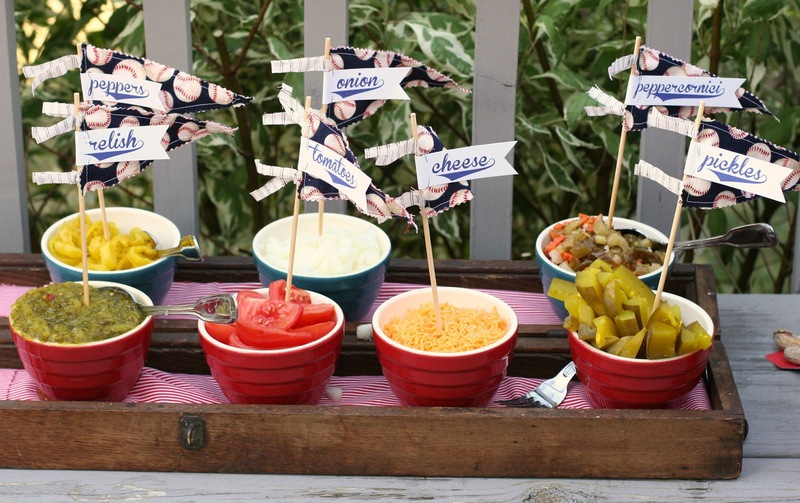 A baseball themed party lends itself to some cool invitation ideas. I was originally thinking to make a baseball trading card with my son in a baseball pose, or a baseball game ticket with all the party info worked into the ticket, but finally decided to try an actual baseball. Why not? It’s got plenty of white space, fits the theme, and will be a favor that kids may actually use before the party even starts. Check out this post for more details and photos on creating, and delivering, the baseball invitations. 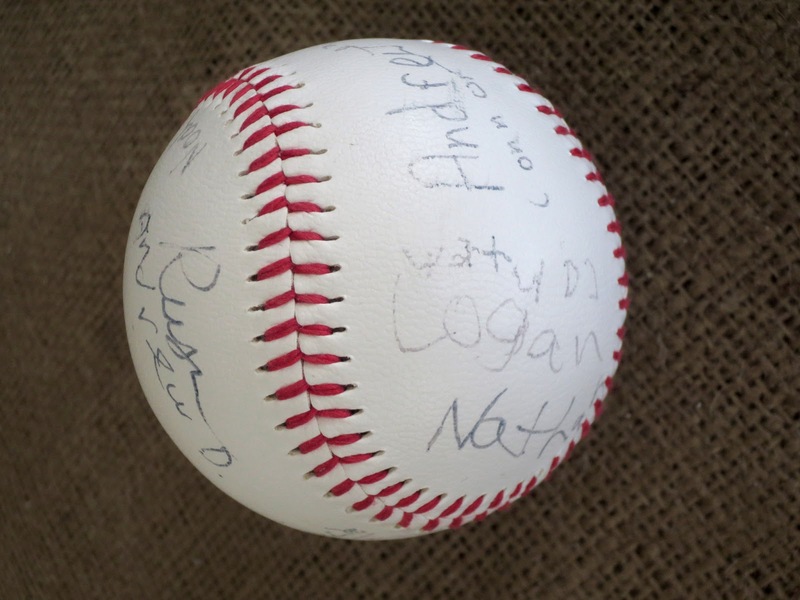 Cost for invitations: $40 for 24 autograph baseballs, no cost for postage since they were delivered. The stamping equipment I already owned. I went with a classic Americana theme for the baseball party, vs. having a specific team like the Chicago White Sox. This way we’re able to use many of the Fourth of July decorations we already own. 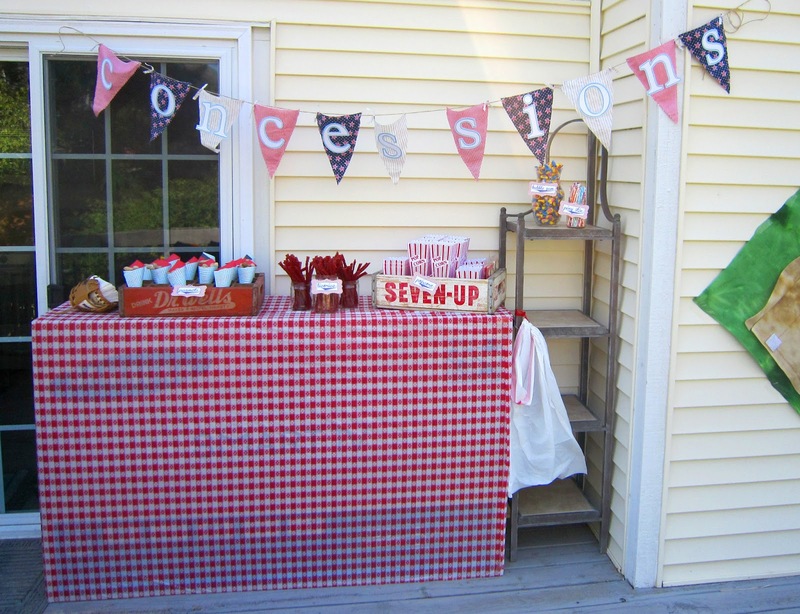 My biggest expense is a few yards of red, white and blue fabric which I am able to use throughout the party. Most of the yardage is cut into triangles for banners hanging between the tress in our front yard. I set eyelets on the end of each triangle so I can reuse and rearrange the banners in the future (like remove the baseball triangles and use the rest for Fourth of July). But after hanging for awhile the triangles keep sliding down. In hindsight, I should have just sewn the triangles directly to a narrow strip of fabric. Red and white crepe paper balls hang from the tress like ornaments. In fact, they are! They’re packaged as Christmas decorations that ended up being 90% off at Target. Hello, Valentine's Day. Hello, Fourth of July. 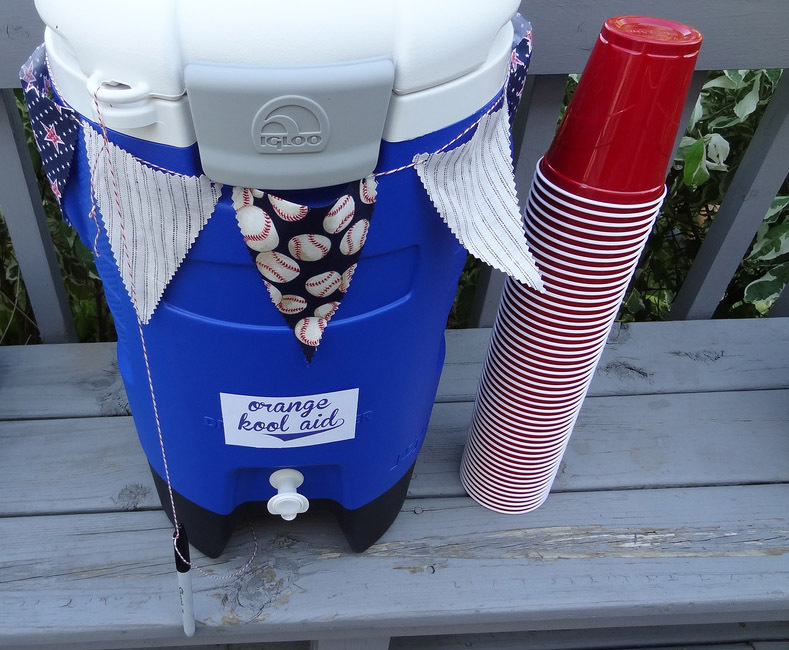 And hello, baseball party! I bought 20 of them for 20 cents a piece. 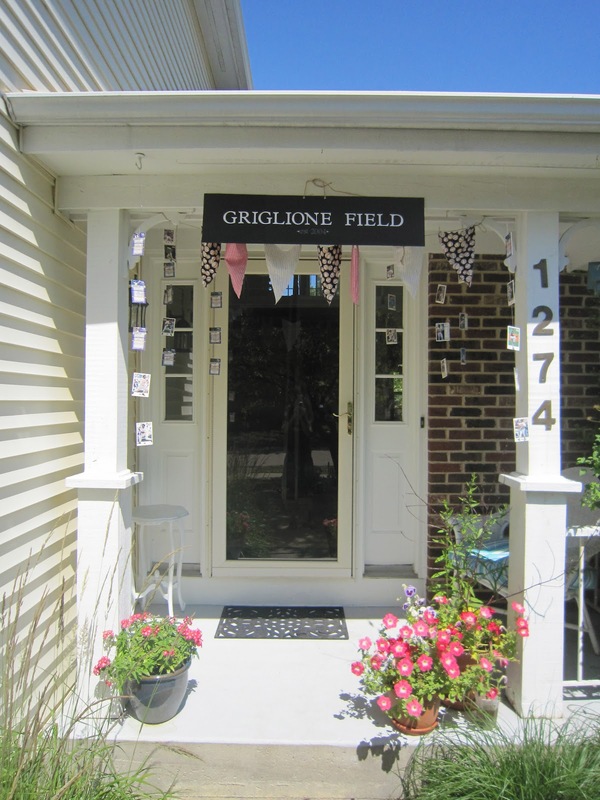 From the porch hangs a sign announcing, "Griglione Field, est. 2004," for the year the birthday boy was born. Die cut letters are attached to black paper over cardboard. I have more banners behind the sign. You can see how they're starting to slide to the center. Hanging from the porch ceiling are strands of baseball cards taped to thread. Super cheap, super easy decoration. It's an outside party, so the main decorations inside are on the sideboard by the front door. The chalkboard (which I use ALL year for occasions big and small) has a baseball birthday message, and some more of the pennants. There are some baseball activities and favors (described later in this post), an old baseball trophy from the 1950's that I scored at an estate sale, and a 1930's ice-bucket-like trophy filled with baseballs. 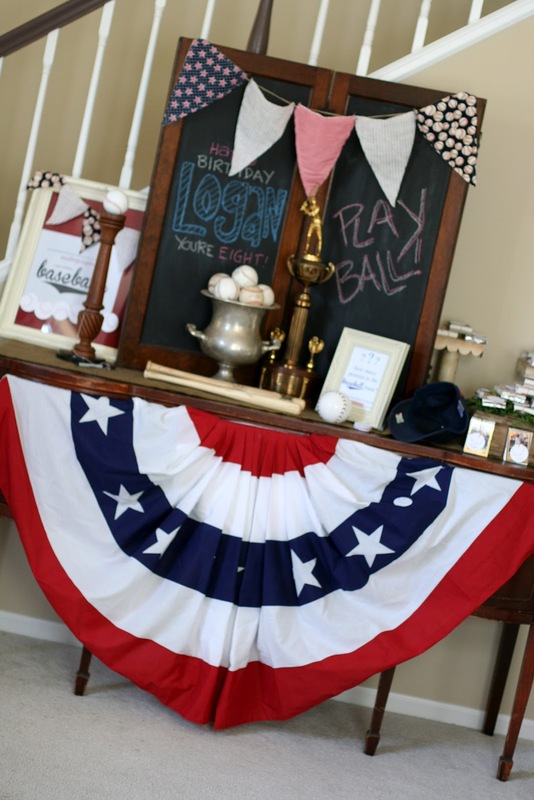 Finishing everything off is bunting from my Fourth of July decorations hanging across the whole sideboard. This makes a nice spot to put the presents under as people arrive. Instead of using helium balloons, we hang regular balloons from the ceiling. Same effect, much less cost. Plus you can do this ahead of time instead of the morning of the party. 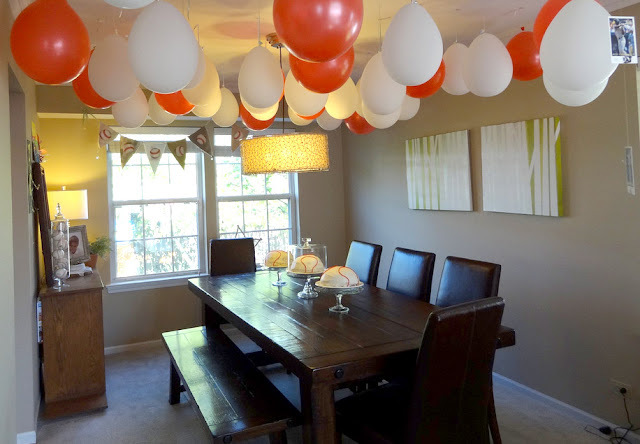 In fact, the white balloons are left over from his Communion party almost two months prior! 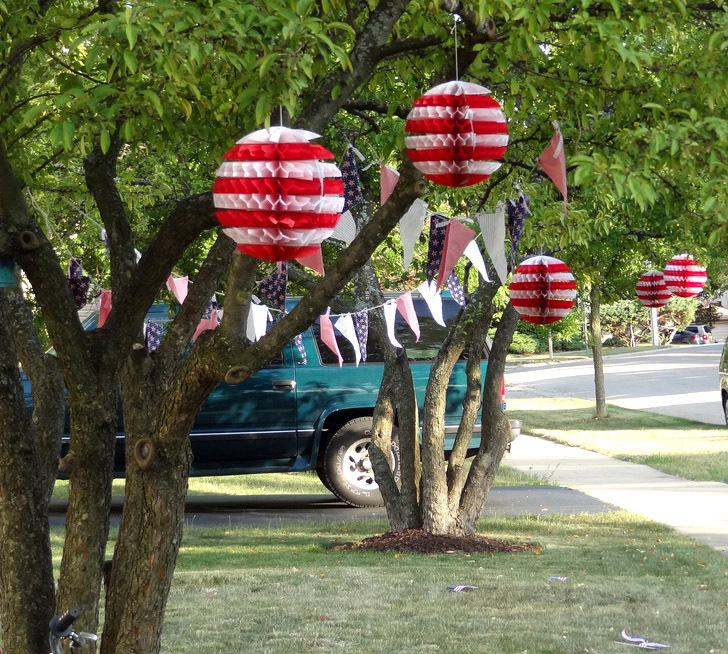 I never took them down, and just added red balloons for the baseball theme. I tried drawing red stitching on the white balloons with a marker. Bad idea, total fail. There are a few baseballs in the tall, skinny apothecary jar on the buffet to the left. In the background over the windows you can see another banner. It’s neutral so it stays up all year and I just switch out the decorations. You can see it decorated for a Pirate Party and Valentine's Day. This time I cut out baseballs from a half yard of patterned fleece (also used in a game described later). Amazingly the fleece baseballs just stick right on the pennant fabric. No sewing, no adhesive, nothing. Super easy. I’ve found that it works really well to have unstructured activities ready to keep the kids busy while you’re waiting for everyone to arrive. Usually I have a couple of these. The first is really a party favor for the birthday boy. 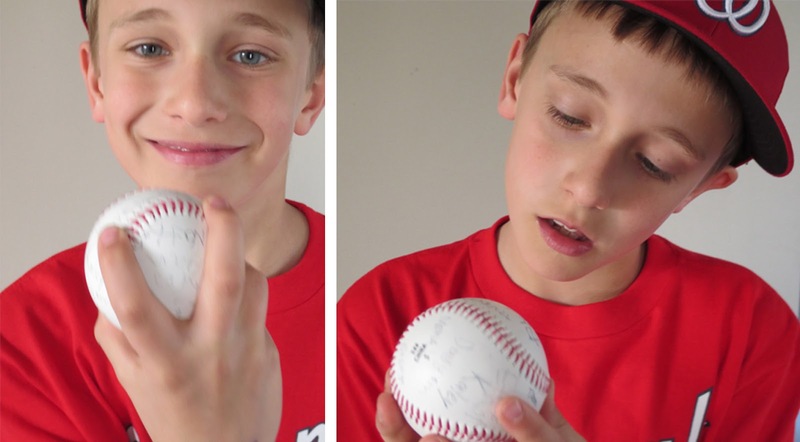 It’s an autograph baseball. 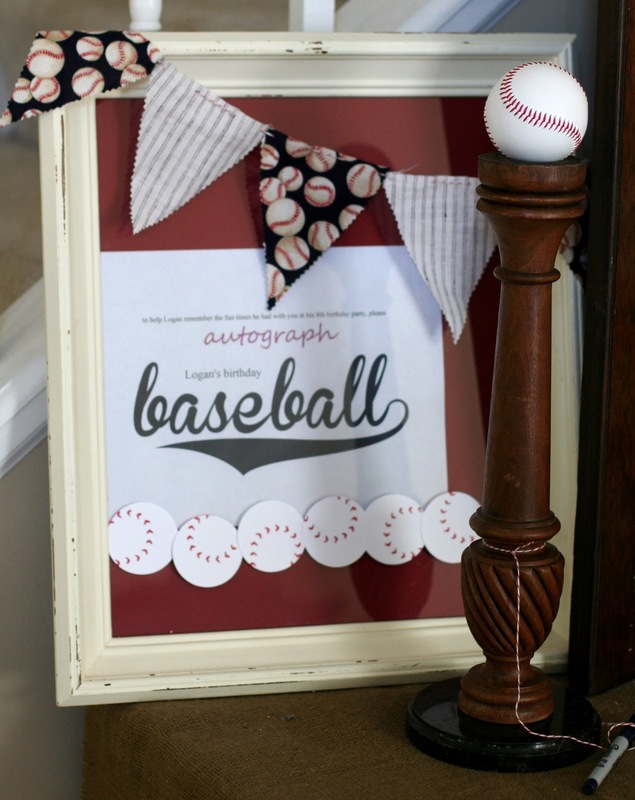 Instead of collecting baseball players’ autographs, however, we are collecting autographs of all the party goers. A framed sign explains this, and a candlestick is put to use as a holder for the baseball. The permanent pen is tied to the candlestick (so it doesn't get lost) ready for autographs. 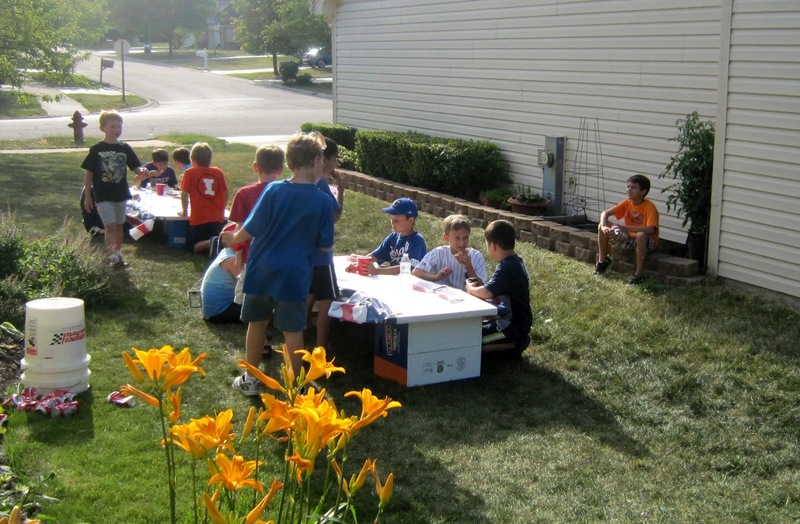 I like having this activity at the beginning of the party, otherwise you may forget about it as kids are leaving. The birthday boy really loves having this reminder of his party and all his friends who came. In hindsight, I should have stamped an “8” in the center before everyone started signing so in the future he will know when he got it. 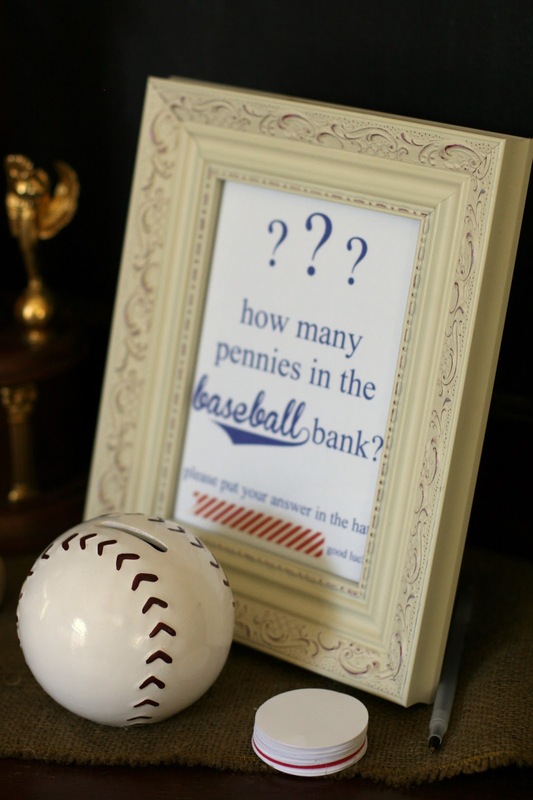 Another activity is to guess how many pennies are in the baseball bank. Couldn’t believe this bank was at the dollar store. Tiny die-cut baseballs are waiting for the kids to write their guesses on (be sure to have them put their names on the paper, most of the guesses were nameless so we had to ask each kid what their guess was before announcing the answer). Again, directions are in the frame. Guesses go into a baseball hat (not pictured). The winner gets to keep the bank and its treasure. That makes for some excitement, and wild dreams of huge riches! 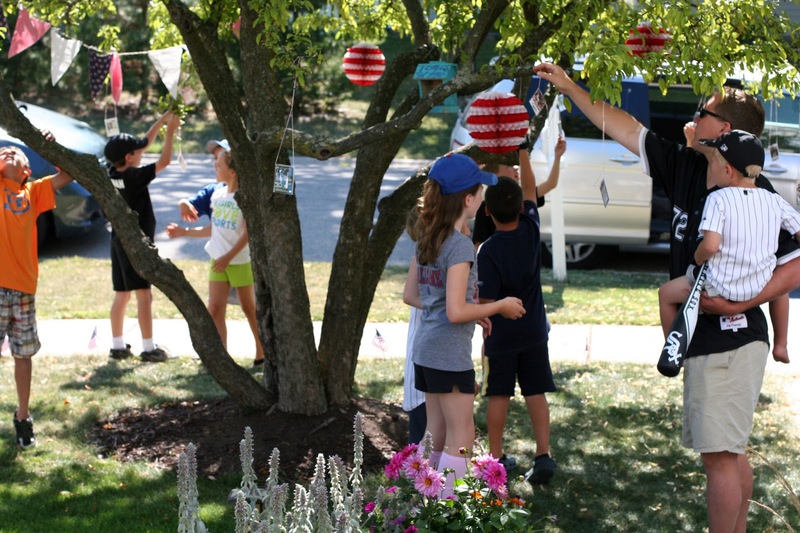 The last activity is for the kids to find their name tag hanging from our tree in front. They are actual baseball cards with each kid’s name adhered over the real player’s info on the front. It was a ton of fun watching them all reach to find their own card. The 30 cards hanging also made for an attention-getting decoration as the kids arrived. 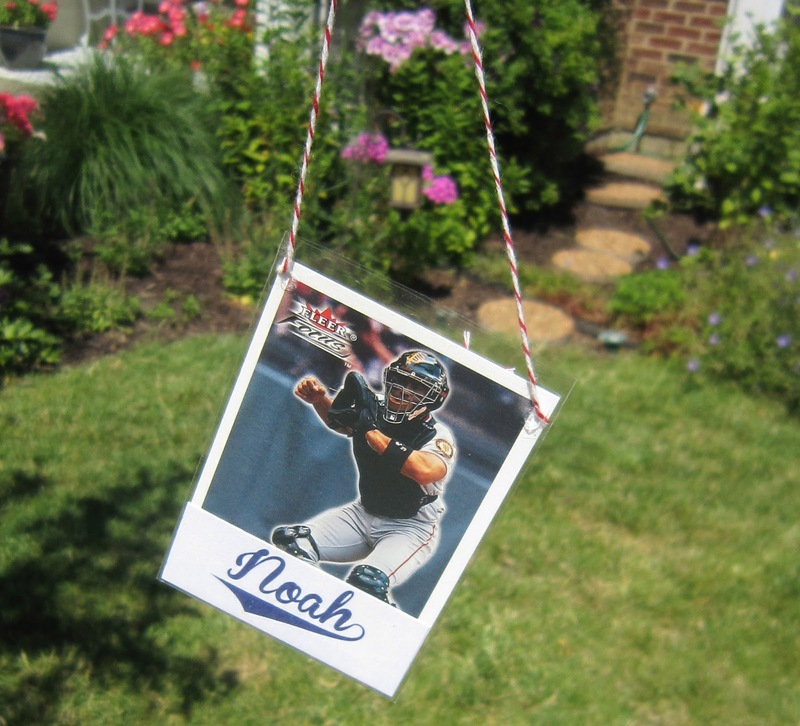 The cards are in a baseball sleeve and baker’s twine is used to hang it around their neck. Knowing that I wanted to break the kids into groups later for the games, I used these baseball name tags to divide them into teams. Everyone who got a White Sox player is on one team, Chicago Cubs on another team, etc. It helps eliminate issues with who’s on whose team. Once everyone arrives we start the icebreaker activity. We have baseball cards from the 1980s coming out of our ears from a collection that my husband bought very inexpensively. We also have a lot of multiple sets of cards. So I thought it would be fun to take duplicate cards and tape them on the backs of our party guests. 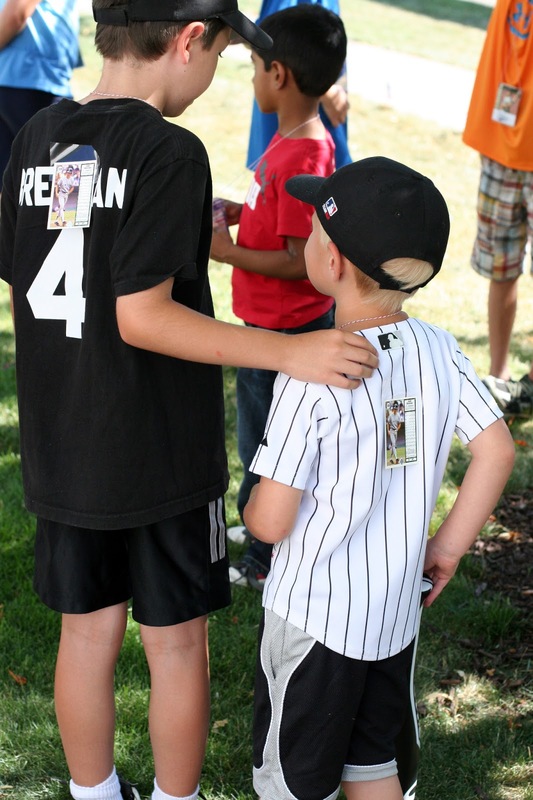 Each kid has to ask questions about the mystery card on their back (What team is he? What position?) and then find the other kid with the same card on their back. If you had future games that required partners, this would be a good way to pair the kids off. 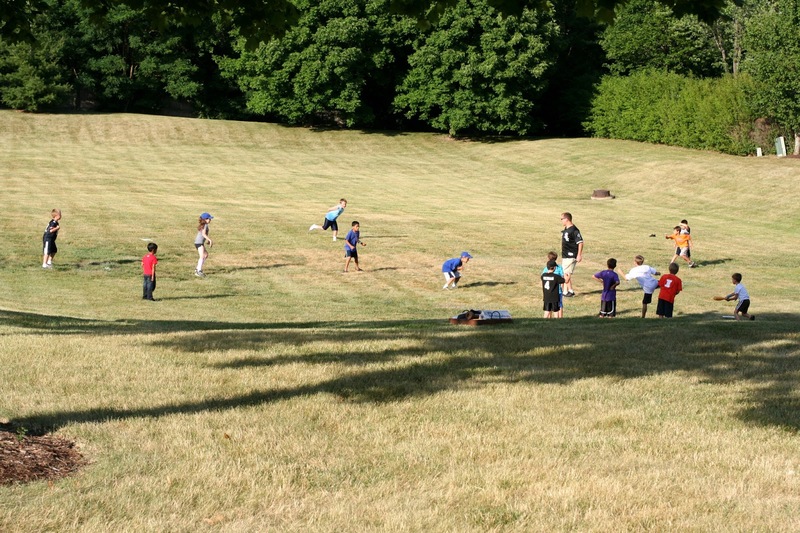 Blindfold Baseball – Almost every party I have includes a version of the classic Pin-the-Tail-on-the-Donkey game. The kids are blindfolded and given 4 baseballs (cut from fleece, just like the ones for the banner decoration earlier). I changed the rules by giving each kid 4 tries to pin a single (1 point), double (2 points), triple (3 points), and home run (4 points). It only counts if it touches the base. The baseball field is made with fleece from the fabric store. A few stitches hold the brown infield in place. Luckily the fleece sticks so well to itself that no adhesive is needed. This game took at least twice as long as the other stations. 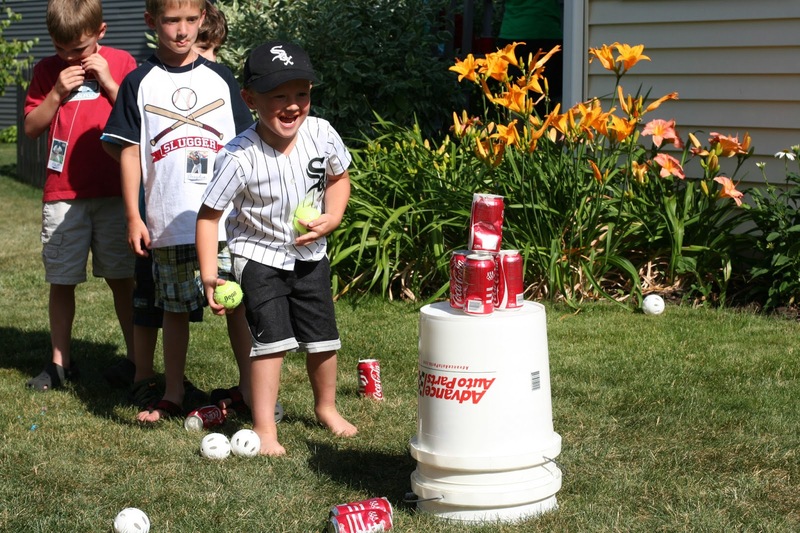 Knock the Cans – Save your aluminum pop cans (plus a few extras to swap with those that get too dented during the game). Fill them with sand and tape the hole on top closed. Stack them in a pyramid on top of an upside down bucket or other small, flat surface. The goal is to get as many off the bucket as possible by throwing a ball at them. Two points if you get the can completely off the bucket, one point if you knock the can down but it’s still on the bucket. 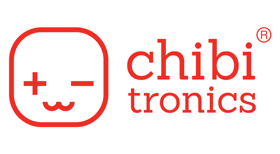 Fun for all ages and skill levels. 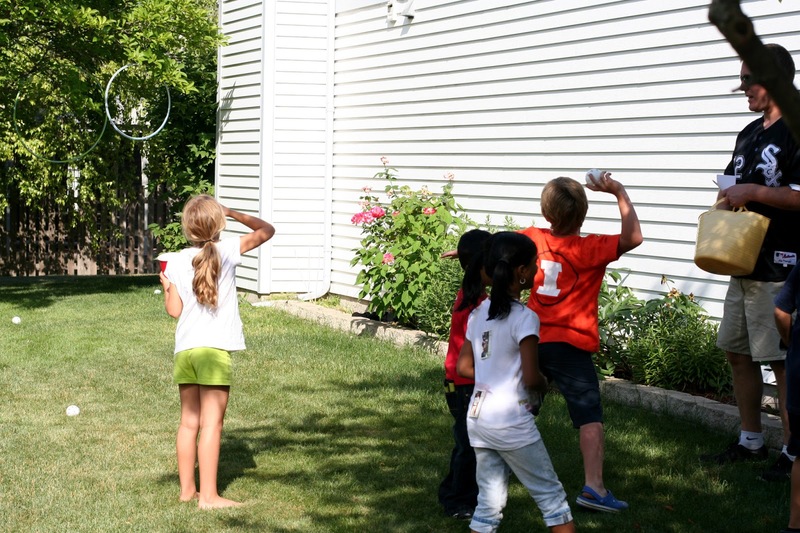 Hula Hoop Throw – A large hula hoop and small hula hoop are hung from a tree. One point is awarded for a ball thrown through the large hoop, two points for the small hoop, and three points if you can throw it through both hoops at the same time (the hoops are hung slightly overlapping each other). To allow for different ages at your party just let the smaller kids stand closer to the hoops. Note, make sure you do NOT play this game next to a neighbor’s house who has aluminum siding! I’m just saying. Target Practice – This one is a purchased game. Throw tennis balls at a target that is covered with Velcro. Of course, award points based on how close to the center you get. Finally, at the end of the party we take all the kids to our park down the block for a game of … you guessed it … baseball. I love seeing my son have fun, but have to admit it is a little disheartening to hear that after all the planning and preparation, the one thing that requires no advance effort is his favorite part of the party. Isn’t that always how it goes?! It was a nice chance for me to relax a little, talk to the moms, and tabulate the results of the games. We gave prizes for the winners of each game, the grand prize winner, the one with the least points, the highest girl’s score, and a few random point totals. Instead of having a bunch of drinks to hand out, I keep it simple and fill a 5 gallon thermos with Orange Kool Aid for kids to serve themselves. Pennants across the lid continue the party theme, and a permanent marker is tied to the lid for kids (or parents) to write their name on their cup. We also had bottled water. 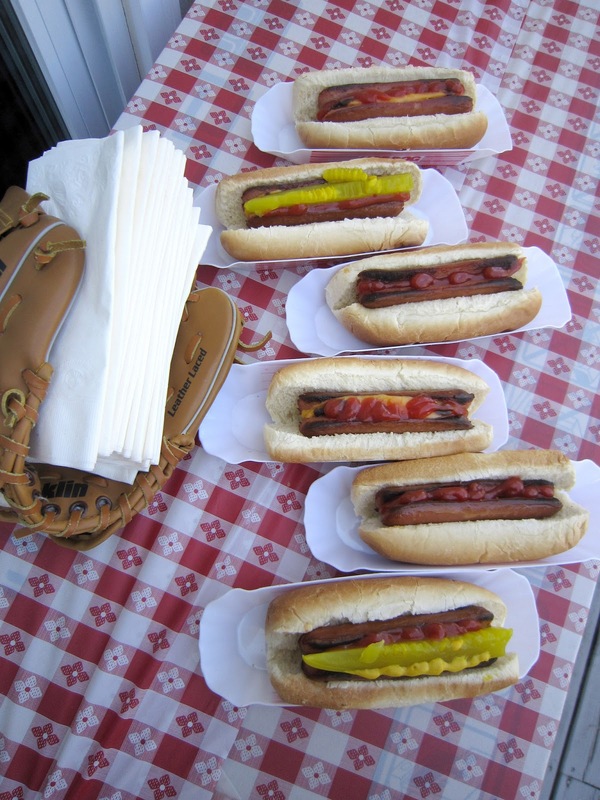 I thought a ballpark-like concession stand would be cute to have for all the snacks. 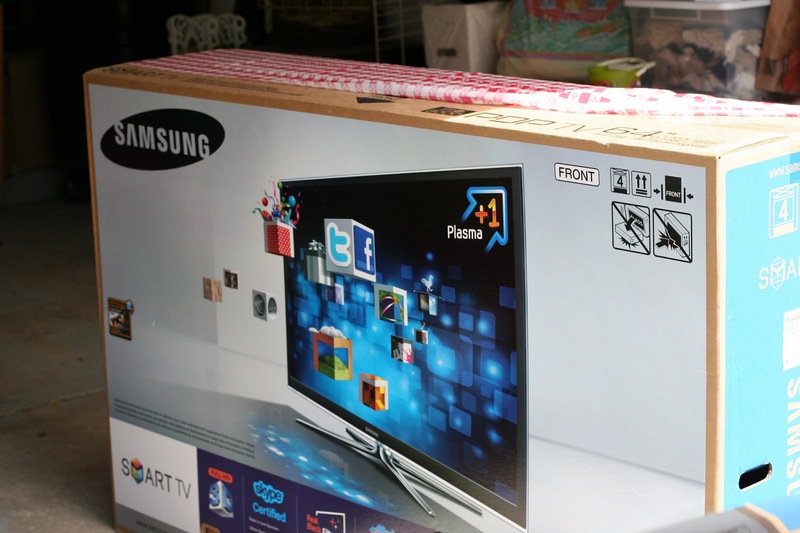 Two dollar store plastic table cloths are used to disguise the thick and sturdy box our TV came in. Pennants spelling out "concessions" dress up the area over the stand on our deck. If we had a flat portion of the backyard, I would have loved to put the stand there, and hang the concession banner in between two trees. We're practical here ... a garbage bag hangs from the far corner. - Peanuts in a shell - 6x6" double sided scrapbook paper is stapled into a cone to make a holder for peanut shells. They are just the right size to stand in an old, divided Coke Cola crate. 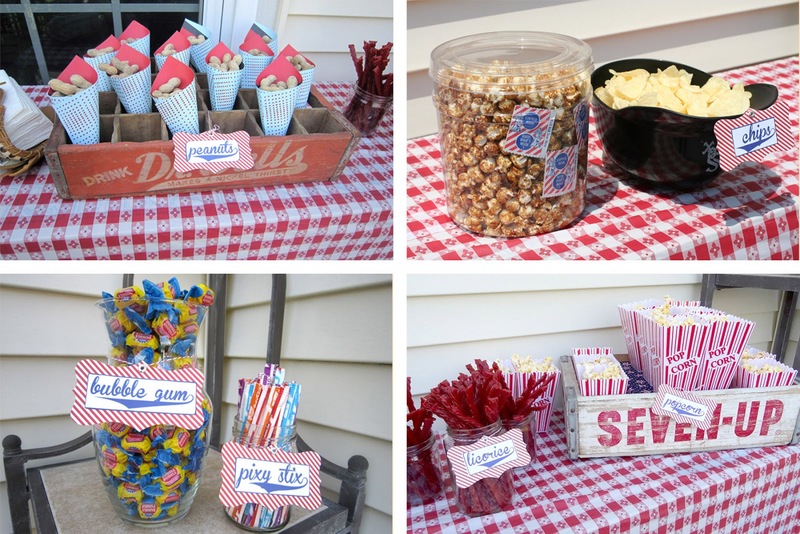 - Cracker Jacks – of course you can’t forget these at a baseball party. Oh wait, I did! I found it on top of our cabinets AFTER the party is over. Does that ever happen to you? Argh, I hate that! 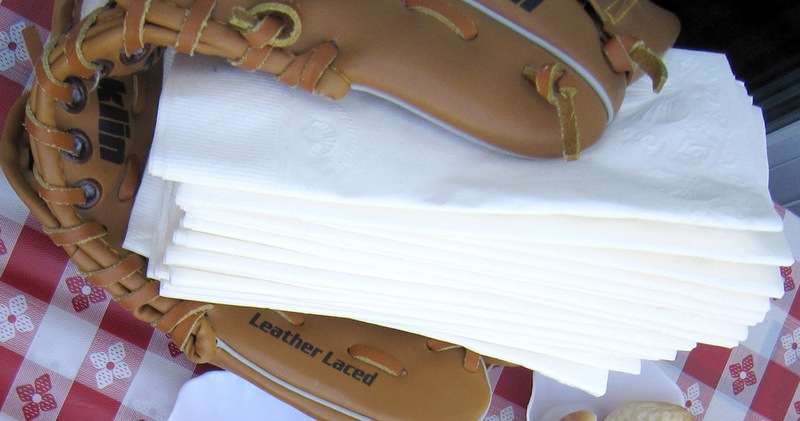 It's windy, so we clean a baseball glove and use it as a napkin holder. I am really impressed at how well it holds the napkins, and fits the theme! 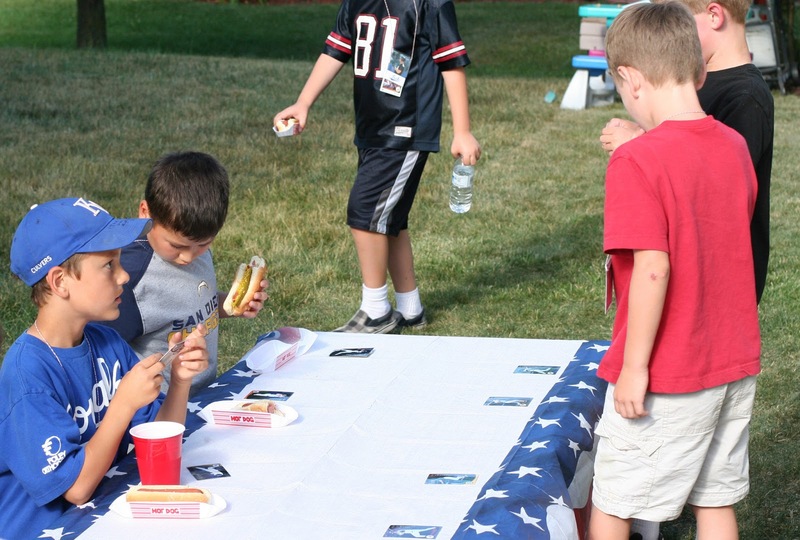 Lunch is super simple ... a hot dog bar. 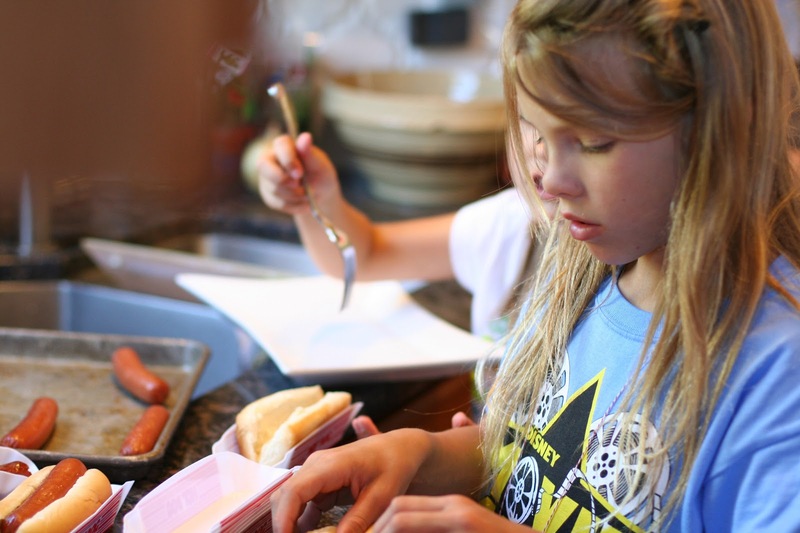 I'm thankful that two of the girls from the party really want to help out in the kitchen, so I have them assemble the hot dogs in plastic hot dog boats from Target (again, bad quality, but they are 4/$1). 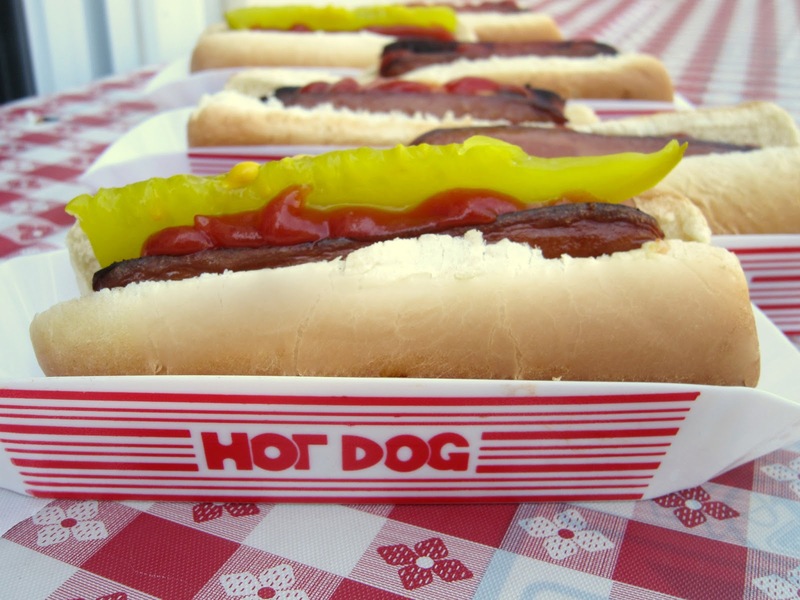 Toppings for the hot dog bar include: tomatoes, cheese, pickles, onions, relish, peppercornici, and peppers. Nothing fancy ... they're eight-year-old boys! But anything served bar-style seems more fun. 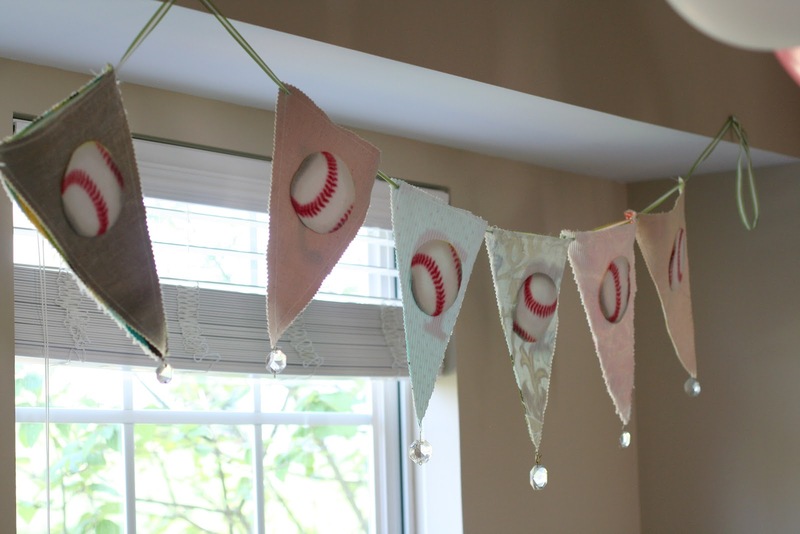 The pennants are sewn with left-over fabric. I slid a piece of wire inside each one so they wouldn't flop straight down. Then printed banners to label the food (again, in the same brannboll fet font). They are held up with bamboo skewers stuck into a piece of Styrofoam sealed in saran wrap. So not glamorous underneath. The divided tray is actually an old gun case I bought at a garage sale for $1. I knew it would be useful for something, and this was definitely it! Macaroni and cheese is also in the crock pot for any kids or adults who don't do hot dogs. With 30 kids in attendance, I know we will be way short of seating. So I get a few of the same size boxes from the grocery store and put our old hollow core doors on top for a roomy banquet table. Again, they're eight, so they don't mind sitting in the grass. Besides, it takes them all of four minutes to finish their meal before they are off to play again! 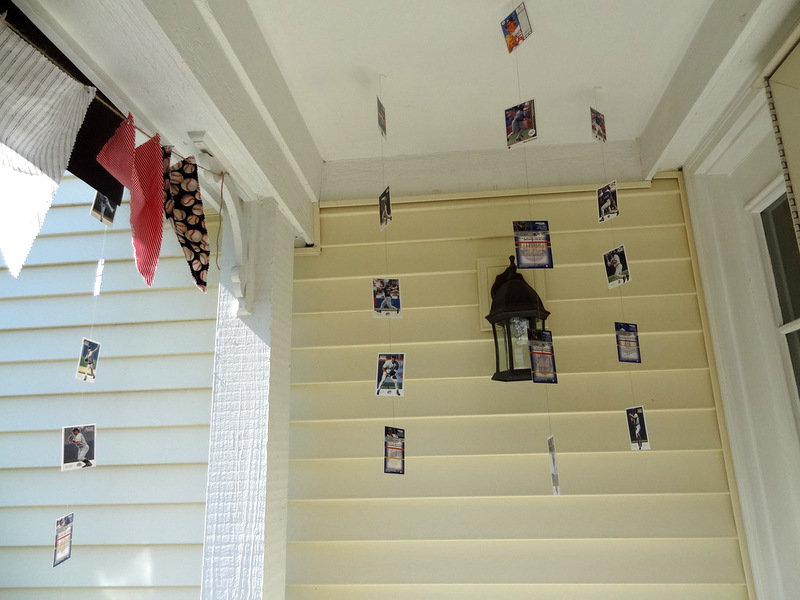 The doors are covered with tablecloths, and a baseball card is taped to each place setting. 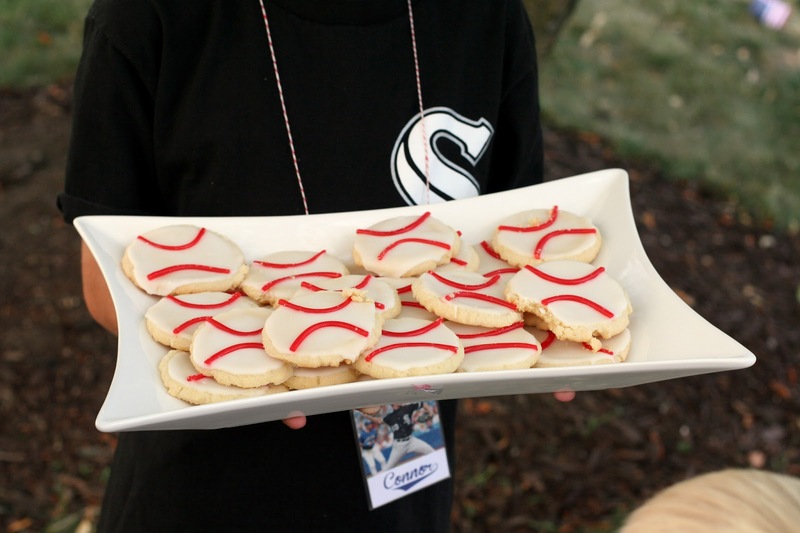 Baseball cookies! Super easy ... sugar cookies with licorice rope curved in the frosting before the frosting dries. You probably know this, but I only recently found out about adding corn syrup to the frosting to get it smooth and glazy like the bakery. And baseball cakes. Three of them! I started to panic with so many kids coming so I made an extra cake while I was at it (totally didn't need it.) 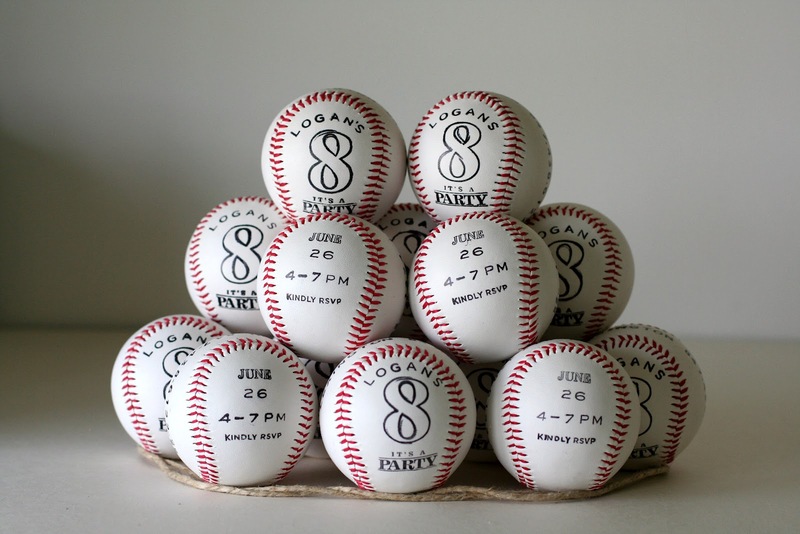 Each baseball is made from two 9" round cakes. I sliced the rounded top off both cakes and layered them on top of the two flat round layers (so, flat round cake on bottom, frosting, flat round cake, frosting, both rounded tops). Another thing you may already know that I recently learned is to use a crumb coat of frosting. You put a light coat of frosting all over the cake and then freeze it. Your final layer of frosting will then be nice and smooth with no pesky crumbs from the cake showing through. Red licorice roping is used for the baseball stitching on the cakes. I wish you could hear the singing, it is the loudest "Happy Birthday" I have ever heard! 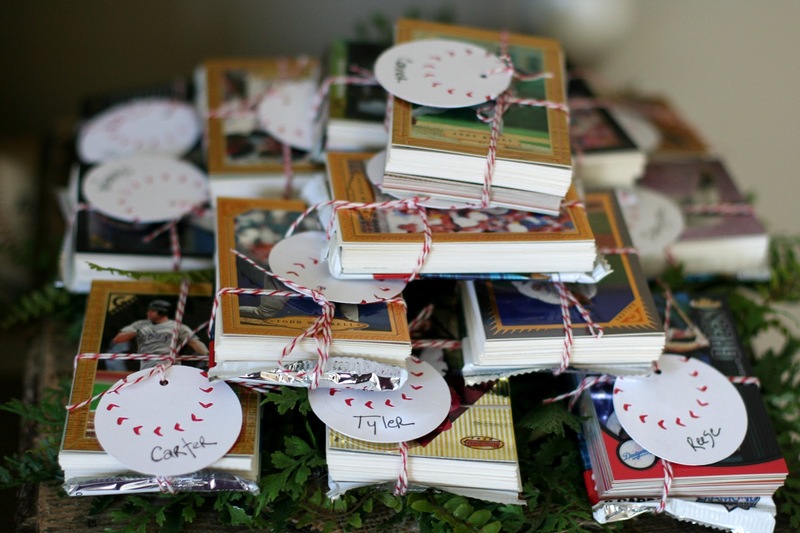 We bundle up a bunch of baseball cards and write each kid’s name on a die-cut baseball tag. Easy! The timing worked out well for a three hour party. 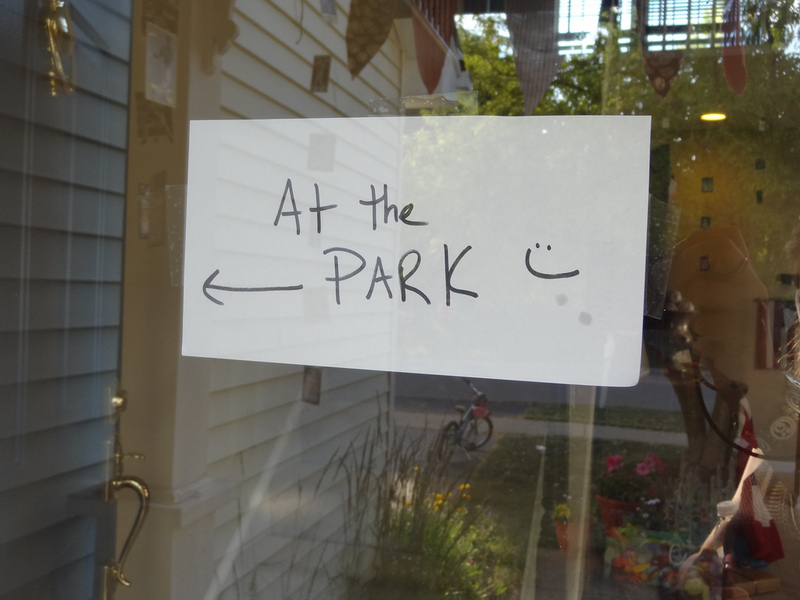 Parents came to the park to pick up their kids (we left a sign on our door in case they forgot). Everyone seemed to have a really good time. It was stressful having an outdoor party since our house is pretty small and if the weather did not cooperate I would have to reschedule, or drastically change the plans. But the nice thing about an outdoor party is that your house is not demolished afterwards. Clean-up is so much easier, and waking up the next morning to a clean house is such a good feeling. 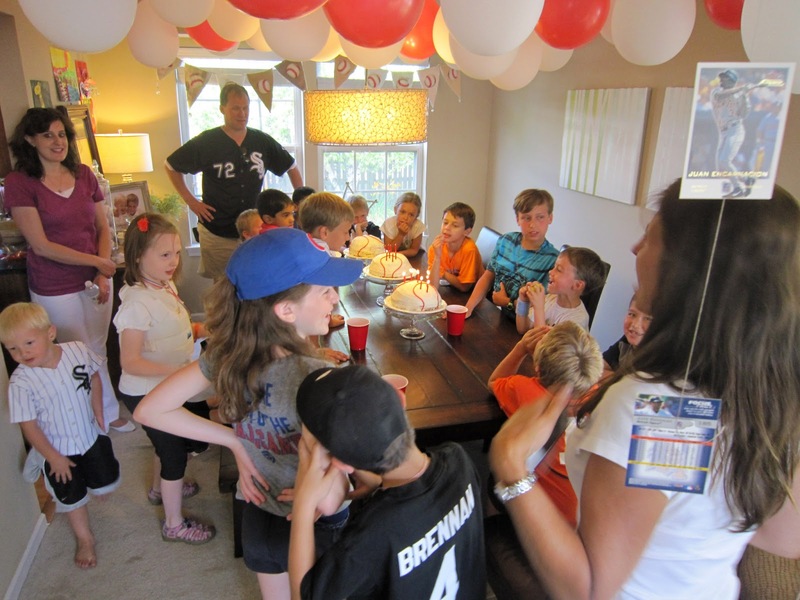 Total cost for the party: $205, which is not bad considering we had 30 kids and several parents. 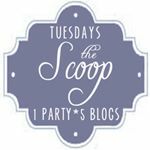 I hope you enjoyed this post, and perhaps can use some of the ideas for your own party, even if it’s not baseball themed. Hi all! It's my day of the month on CAS-ual Fridays Stamps to play with stamps and show a few cards. Wanna see?! Here's another card that uses the stop sign octagon. Stamping it repeatedly in a row resulted in some nice, squatty hexagons and triangles, which are colored with alcohol markers. The "never" is generationally stamped to create movement towards the stop sign. This one layer card uses the flower and sentiment from Mum's the Word. The flowers are stamped in VersaMark, and then chalk is sponged over it. I like how the flowers all blend into each other with this technique to make a rather solid background, in contrast to the white sentiment area. These last three cards all feature mums made from the beanstalk stamp from Beanstalks. What a fun discovery! I was so excited when I realized you could rotate this one beanstalk around in a circle 9 times and it makes a perfect circle! Even the center turned out pretty neat with all those tiny circles. I wanted the beanstalk and sentiment (from Bold Wishes) embossed in black to go with the modern styled card, where everything is off the edge. Plus it would make my coloring go a little easier and help stay in the lines : ) Everything is a bold fuchsia, except the intersections which are melon. As luck would have it, there is also a smaller beanstalk in this set. YAY! More versatility for the mums. On this one layer card, the mums are watercolored in, inspired by the Moxie Fab Challenge this month. Much quicker than coloring in each petal! Sentiments from Big Thanks dance across the card in gold. Finally, an ombre, layered mum for Mother's Day. Originally, I layered all three layers right on top of each other and lined up the pattern. Yawn. So then I rotated each layer so that the petal would fall in between the two petals on the previous layer. Better. Then I slid the middle layer off center. Bingo! Much more dynamic this way. A subtle difference, for sure, but believe me, it really helped the design. Complimentary adjectives for mom from Truth Is are stamped around the circle, and her name is embossed on the leaf I cut out. PS. 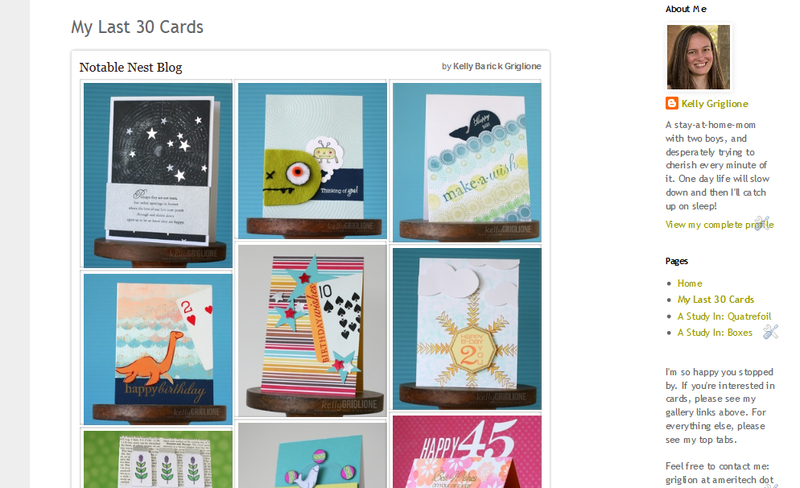 It seems there is a lot of interest in learning about creating a gallery of cards for your blog using Pinterest. I'll do a step-by-step tutorial on this early next week. I'm so pleased with it that I got rid of the entire left column on my blog that used to show the top ten posts from the last month. There's really no need for that now. Yay, so much cleaner now! 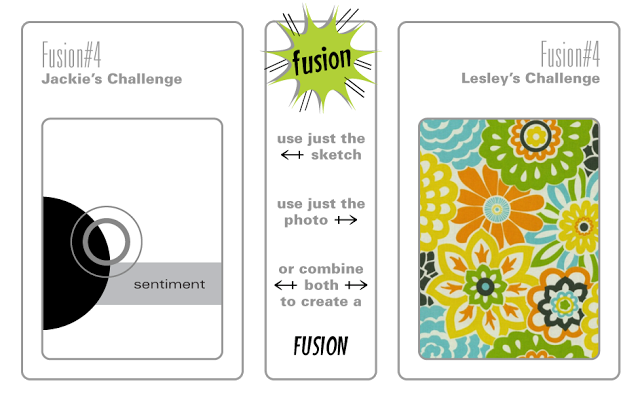 Well so far it looks like the winning cards you've chosen at the Fusion Challenge have been based on a FUSION of the inspiration sketch and photo. How interesting! As a Scientist for the sketch challenge, I will not be looking at the photo to make my card. Which, after you see my card, may have you a little confused. My card colors are EXACTLY the same as the ones in the photo! Completely coincidental. Two months ago I printed off all the sketches and taped them to my blogging calendar, which is what I've used to design the Fusion cards. The first time I'm seeing the photo is right now as I'm writing this post. How strange! Anyway, I knew I wanted the large circular element to be a monster head. Originally, I was going to use the inverse of that second circle to make a monster head with its mouth open yelling "happy birthday." Not a bad idea, it just wasn't working so well. 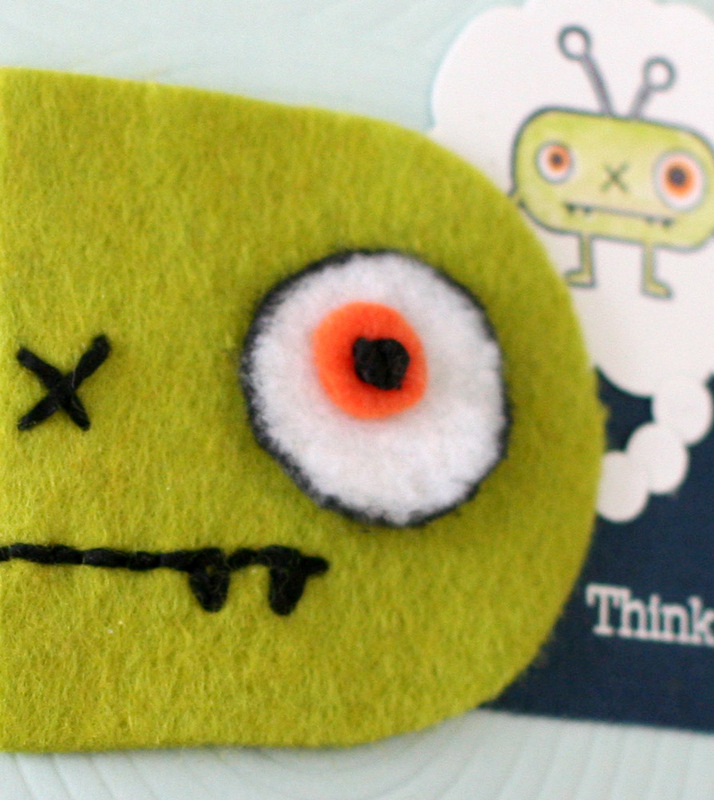 So that little circle got switched to a thought bubble of another alien. 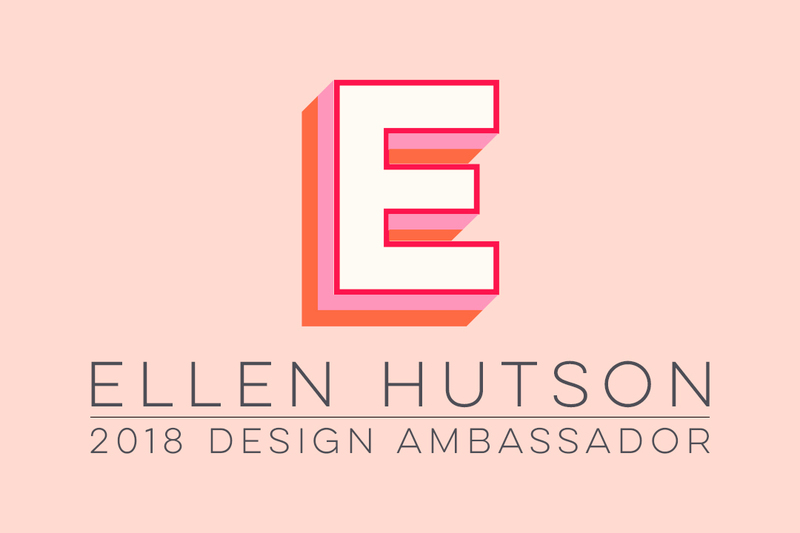 Sure hope to see you in the Fusion Gallery this week. Remember to link up your cards by Wednesday. PS. Has anyone heard about the ability to link Pinterest boards to your blog?! I was SO THRILLED that I stayed up WAY past my normal late bedtime last night (the sun may have been coming up already) to play around with it. I've always wanted a gallery with just one thumbnail of each project so someone new could take a look and immediately get a feel for your style. 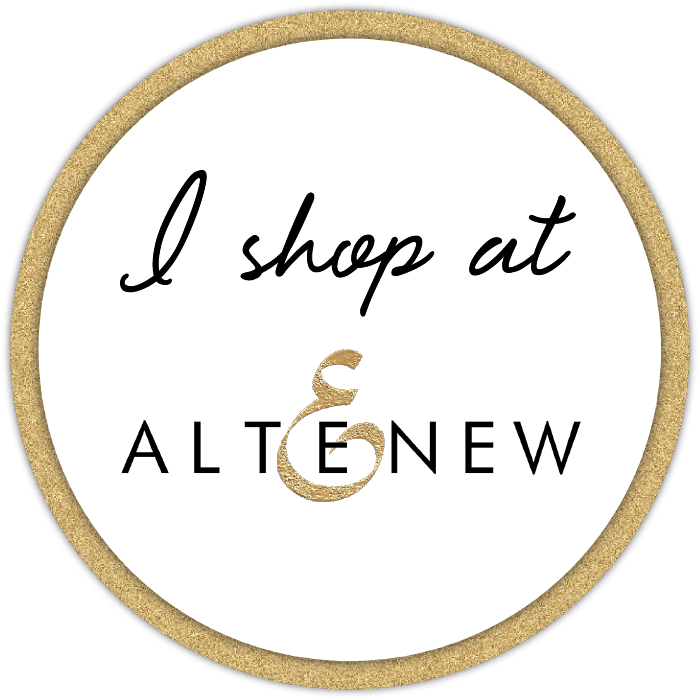 For my blog AND for blogs I visit. I know you can sort on categories, but you are still stuck with the full post. I just want a tiny picture to see them all in one place. See the new pages on the top right of my sidebar? I have a page with thumbnails of the last 30 cards that I've posted to my Notable Nest board in Pinterest. It updates automatically, people!! That is so awesome, no extra work to maintain, aside from your normal pinning. 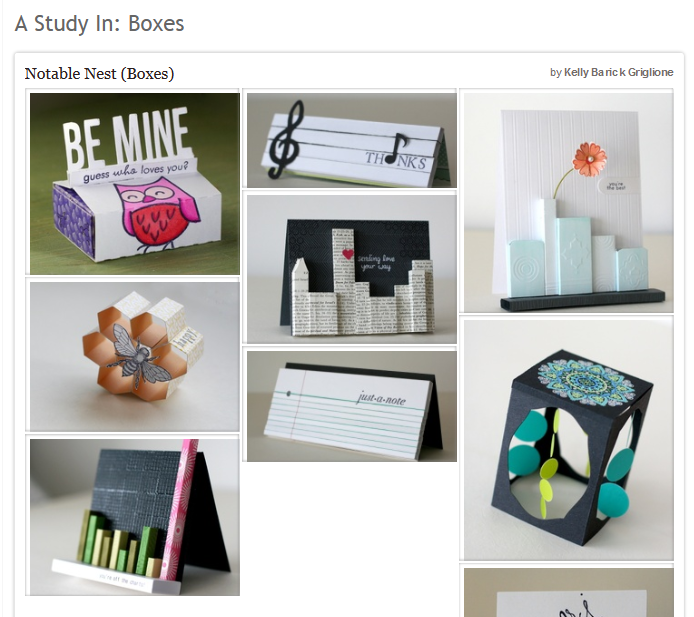 I also created boards/pages for the two series I've done on boxes and quatrefoil. So now you you can see on one page the entire set. LOVE THAT!! If anyone's interested, I'll do a post with some how-to's later. More Birthday Wishes for Michele! CASE Study: JJ's Chevron Card!